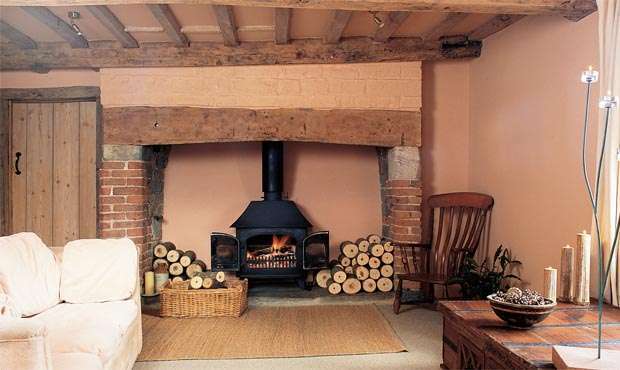 An inglenook fireplace can be a great addition for any home, creating a cosy spot for relaxation. But getting it right can be tricky. After the initial joy of discovering the chimney opening, we paid a local blacksmith to construct a canopy and bought a dog grate for burning logs. It looked great, but every time we tried to light a fire, in a very short time the room filled with smoke. I have since discovered that there is a formula for relating the height and size of the canopy to the size of the grate and fire opening the lesson is to get a proper sizing calculation carried out. Inglenook means chimney corner and many of the originals were up to 2m wide, often as tall, and had seats set within them. A fireplace this size is totally impractical in todays well insulated, centrally heated homes, as they require a huge amount of ventilation to work properly. If you want to use such an inglenook today, it makes sense to convert it into a smaller, more practical fireplace. This is usually done by fitting a register plate to seal off the large flue gather and then putting in either a stove with a flue, direct into the chimney, or a canopy to gather the smoke from a smaller grate. If you decide to build your own inglenook, there are consultants who will help design the structure and type of canopy to ensure you get it right. There are even firms who produce canopies and inglenook furniture as a speciality. One of these, Butler Meadows Design, services the whole of the country. Most of our clients already have their own builder or are self-builders, so we offer a design package. This includes site visits and then preparation and supply of a working design drawing for the fireplace produced in liaison with the self-builder or their designer. Butler Meadows also assist in the redesign of original inglenooks. 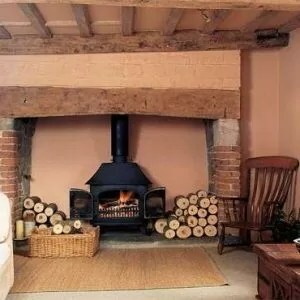 If you’d like a timber beam across your fireplace, the specialists in this department are Oak Masters of Sussex. The firm also provides beam casings to hide unsightly lintels or other unwanted structures. If you are installing a timber beam, ensure that the back of it has been cut away at an angle to assist the draw of the fire. For original old beams, the best source is a reclamation yard. Oak and hardwoods are the best option for fireplace lintels but far cheaper is a reclaimed railway sleeper at around $15 – 25 the trick is to make sure you select a clean, untreated one. “Selecting the right quality of brick and the style in which they are laid is vital to getting an inglenook to look right,” says bespoke fireplace specialist HG Matthews. The Chesham based firm take their bricks so seriously that they produce their own. Irregular handmade bricks often look best in an inglenook and the older smaller bricks tend to look better than the new large metric bricks. Reclamation yards are often the place to go for inglenook bricks. The hearth may also be laid in brickwork but alternatives include specially made firebricks or stone flagstones. There is a fire risk with any open fire so there are minimum requirements for the size and height of a hearth in relation to the size of the fireplace. The greatest risk of fire is from sparks and a fireguard is essential whenever the fire is unattended. A & M Energy Fires make mesh spark curtains that are adaptable to any opening. Invented in the 19th century, they offer safety and convenience in keeping with the traditional inglenook. The National Fireplace Association recommend that the plan area of the base extends at least 6 beyond the front and sides of the fire basket below. The neck or upper part should be at least one sixth of the of the base area and extend a minimum of 30cm above the register plate, with the base of the canopy being about 55cm above the fire or around 75cm above the hearth. Firms such as Esse and Dovre produce a range of standard size canopies but you should also look at Audnam Metalworkers who produce a vast range of different canopies for inglenook fireplaces. They range from plain or hammered finished copper, brass or steel to a combination of either with hand rivetted seams and a steel back all are made to measure specials. Another specialist, The Inglenook Canopy Co, offer a bespoke service for the commission of inglenooks, fire baskets and chimney lining systems. A smaller inglenook could have a gather built into its structure in place of a canopy, either using bricks or tiles. As with the canopy, the gather provides a smooth transition from the rectangular shape of the fireplace to the round section of the chimney flues. There shouldnt be any horizontal faces or sudden changes in shape or size. The smoother the transition, the less resistance there will be to the flow of the gasses. Further information on canopies can be obtained from a selection of excellent leaflets produced by the National Fireplace Association. The style of grate you choose will depend partly on style, but also on the type of fuel you are burning. Most people choose a cast iron basket grate, often in conjunction with a decorative cast iron fireback to help reflect heat back into the room. Logs will burn in a coal grate, but wood burns better and gives more heat into the room when placed flat on the hearth. To help the logs burn, a simple pair of firedogs are the solution metal upstands, often decorative, against which the logs can lean. Solid fuel stoves, vented directly into the chimney via a sealed flue, are considerably more efficient than an open fire, as they slow down the speed of burning by controlling the airflow. Many have glass doors and so you can still enjoy the sight of flickering flames. For a fireplace to work at all, it needs to have ample ventilation and there are rules under Part J of the Building Regs specifying the minimum requirements in relation to the output of the fire. Although the Regs only cover new building work, renovators should adhere to the guidelines, as a fire without adequate ventilation can produce lethal carbon monoxide gas which is colourless and odourless. A strong updraught in the chimney does not mean draughts in your home. The diameter of the flue is also crucial larger fires require larger flues. Correct flue sizes are also included in Part J of the Building Regs based on the size of the fireplace opening and the type of grate or appliance. To ensure a fireplace draws properly and burns well, without billowing smoke, it is a good idea to have a proper sizing calculation carried out.